I decided to join the fray of retailers of selling Christmas before Halloween. Seems each year that Christmas starts a month earlier than the last year. Next year, plan on seeing Christmas trees up in department stores after the 4th of July. I hate the trend as it kinda takes a way from the excitement. Is it so bad to enjoy Halloween and Thanksgiving first? 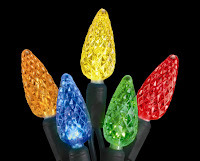 But aside from that, a new idea on the “Going Green” front is LED (light emitting diode) Christmas light strings. They are safer, easy to use, and use less energy than the traditional lights we have complained about putting up every year. Now that they are becoming more common place, different color combination are available for your viewing pleasure. So maybe think about saving yourself some money this holiday season by going a little green. I know Dakota Electric will be providing a $5 off coupon on LED lights strands in their October bills so be sure to take advantage of the extra savings. If you know that they are doing this in other counties as well, be sure to let me know so I can pass on the good news!